Judith Rooks’ words seem especially prescient from where I sit in South Carolina, where three babies have recently died after being born at the birth center I started. By 2012, my belief that I was doing good for the world as a midwife had seriously waned. I was haunted by the knowledge that, statistically speaking, we were putting lives at risk with every baby we caught. I was frustrated by disagreements with my partners over issues of safety. Yet, I was not yet willing to walk away from my life’s work, my successful business, my social support network, and my position of prestige as a health care provider. As a distraction, I latched on to issues that soothed my ego, such as achieving better racial diversity in midwifery. The stress of my mental unease wore on me. I picked fights with my partners when they would not stand with me on the racial diversity issue, and years of tension culminated in them kicking me out of the business that I had started. They gave me ten minutes to gather my things and leave the building. As I drove home, I gripped the steering wheel tightly, my heart racing in my chest. I GOT OUT. It was messy and confusing and ugly, but I was out of there for good. I was relieved, but I wasn’t ready to be honest with the world about why. That was January 2013. In April 2013, I heard the first rumors of a baby’s death soon after her birth at the center. In September 2013, news of a second death was splashed across local newspapers. And in January 2015, a third death was reported. My thoughts and emotions ran rampant. One moment, I would arrogantly congratulate myself: No deaths on my watch, and three on theirs, who’s the best midwife now? Another moment, I would wonder at my favored status in the universe, that God had spared me from all the horror, and just in time. And in my most honest moments, I knew the truth of it: I had gotten incredibly, ridiculously lucky. And those three mothers who sat at home with empty arms, they simply had not. As I perused the comments section of the news articles online, a common rejoinder from midwives and their supporters stood out again and again: “But, babies die in hospitals all the time, and that doesn’t make the news!” A mistaken response indeed, as the death of full-term, otherwise healthy infants of low-risk mothers in the hospital is vanishingly rare; the vast majority of babies who die in the hospital are premature, have severe anomalies, or are born to high-risk mothers. 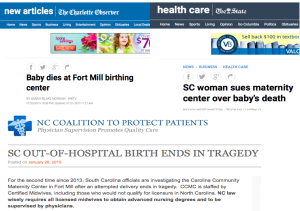 The birth center experienced three deaths of full-term infants, born to (supposedly) low-risk mothers, all before the center had a chance to reach the 1000-birth benchmark; based on rumors in the blogosphere, the center was closing in on 700 births total. 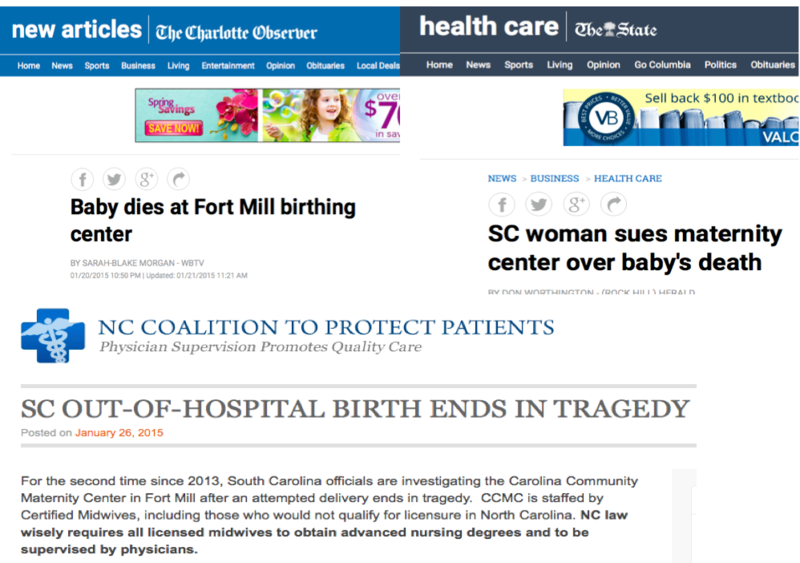 The birth center in Fort Mill closed its doors on the last day of February, 2015. By the first week of January, 2013, my stint as a licensed midwife was wrapping up, even though I didn’t know it at the time. The same mother with the straight blond hair lay in front of me, about to deliver her second child with me in the very same room where she had safely delivered her first a few years before. She was calm; she knew this was “as safe as life gets.” I felt the relief at the long-awaited sighting of the top of her baby’s head; I felt that predictable, well-hidden panic in my chest as forehead gave way to face and head and shoulders tumbled out; I felt that tight wad of anxiety release as that baby mustered up a lusty cry. I waited watchfully for the placenta, delivering it carefully into a bowl, and massaged the mother’s uterus thoroughly to prevent excessive bleeding. I breathed. Once again, I had made it through without disaster. This would not be my one in a thousand. My one in a thousand would never come. Bad things would only happen to someone else, somewhere else, on another day. How those words resonated with me. I had not reached the point of taking the NARM exam and officially becoming a CPM, but I was an apprentice, and my senior midwife insisted that I represent myself as a midwife – to the extent that I would cover call for the practice when she was away for a weekend. I remember thinking “I need to get out of here.” The unicorns and rainbows, the candle-lit waterbirths, the peaceful-empowering home births were being revealed for what they were. This midwife would say “we only take on low-risk clients” but then I couldn’t figure out what -if anything – would be considered a risk too high for this midwife to take on. I needed to get out – because someone was going to die – and I wasn’t interested in participating in that. My belief – at the time – this was years ago before we could all share stories on the internet – was that this midwife was an outlier – she was a cowboy – I had landed in the worst possible apprenticeship with the most reckless midwife and that surely, SURELY, if I found another midwife to work with, I would learn true, low-risk, appropriate midwifery care. I remember feeling so relieved to get out of that practice – I remember hearing about horrible hemorrhages, and train-wrecks waiting to happen that had come through her practice. I was so relieved that I was no longer a part of it. I studied, briefly, under other CPMs. And I learned that they had the same piss-poor stanards – well, maybe a little different ‘style’ – but generally, they practiced carelessly and recklessly – and I realized I couldn’t do it any longer. I hope more CPMs and apprentices will start to come forward. Thank you for sharing all of this on your blog. Wow, thanks for sharing your experience! I know so many student midwives who dropped out. I remember thinking that they just didn’t “have what it takes.” Now I look back and think, maybe they did have exactly what it took to be really honest with themselves and realize when they’d made a mistake before they got in too deep. I admire you. Yeah. That too. I worried that I would be outed as unfit for midwifery by my peers – because I “didn’t have what it takes.” I remember being worried that I would be publicly called out for it. No, I wasn’t willing to sacrifice my integrity any longer for it. I wasn’t. Those subtle digs – and the deplorable practice environment and crappy safety standards are what made me leave. I don’t think I’ve ever felt overtly proud of this. I’ve felt more like a drop-out and a wimp. I still don’t publicly talk about what I saw and what I know happens at home births with midwives. I respect very much what you are doing. It must be difficult. You are brave.